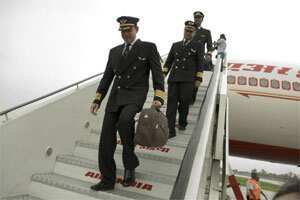 New Delhi: A section of Air India pilots on Friday warned of an agitation to press their demand for immediate payment of salary and incentives, pending for the last few months, and issues pertaining to their career progression. The IPG represents about 300 pilots of the pre-merger Air India, while about 1400 pilots of the erstwhile Indian Airlines owe allegiance to the Indian Commercial Pilots Association (ICPA), who are also protesting on same issues. However, the ICPA would not be joining their IPG colleagues in their protest action, at least at this stage, the sources said. Besides the delay in payment of PLI (productivity-linked incentives), the IPG sources said the Air India management was deciding on issues relating to their career progression and promotions which was under the jurisdiction of the justice Dharmadhikari Committee that is going into the entire gamut of HR issues relating to the merger of the two state-run carriers. The sources said by taking decisions “relating to our career progression, the management is pre-empting the outcome of the Dharmadhikari panel which is yet to submit its report." The issues on which IPG is protesting also include training of pilots for the new Boeing 787 Dreamliner, whose induction in Air India is likely to start by the end of this year.